This week has been dominated by one bird over this side of the pond, early Monday morning, not the sort of time you want news of a 3rd for Britain slipping out over the information services but that’s exactly what transpired after Hartlepool ringer Chris Brown trapped a White-throated Robin in his mist nets. A 1st-summer female initially misidentified as a Red-flanked Bluetail, a mistake swiftly corrected, it became the first ‘twitchable’ individual of this species ever and the first one for 21 years, providing an opportunity for almost every British birder to get a British tick. 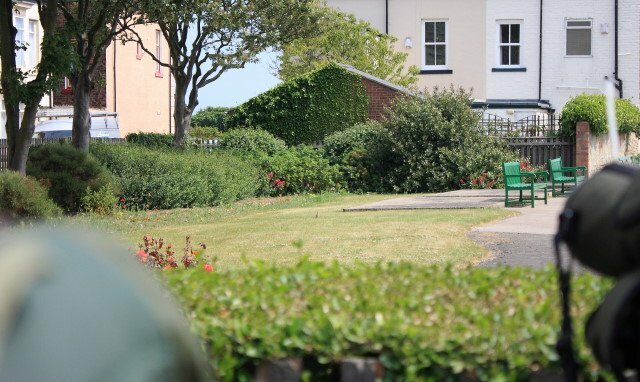 After ringing, the bird was released in bushes adjacent to a small bowling green on the headland at Hartlepool and performed off an on from Monday to Thursday delighting several hundred birders with views. It even survived a full blown bowls match on Monday afternoon with two dozen pensioners kitted out in whites just a few metres away. The nearby ‘Doctor’s Garden’ well known for hosting several good birds over the years became it’s bolt hole when it needed a rest. Surrounded by 3.5m brick walls this particular garden posed a challenge to those arriving whilst the bird was ensconced within. 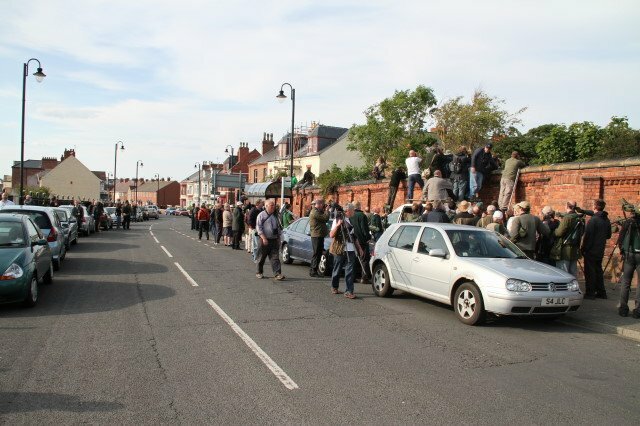 Not for the first time at this site birders innovated and used a variety of methods to view over the wall, including standing on the roof of a number of strategically placed vehicles and deploying up to nine ladders and a well ordered queuing system (it is Britain after all) to allow people to view. Despite the apparently chaotic scenes the Robin stayed for four days and appeared to take it all in it’s stride feeding and sunbathing happily for the crowds. Such huge interest inevitably caught the attention of the media and the standard of journalism employed ranged from rubbish to utter garbage; littered with inaccuracies and errors, spurred on by comments from one or two fame-seekers. Sadly the mainstream media here in Britain continue to view birders as a bit ‘odd’ and whilst several good birder journalists like Michael McCarthy at The Independant have made inroads into changing that, the standard of reporting at events like this seems to regress to overused cliches and scant regard for accuracy. June is often a quiet month for good birds with most having reached their destination and going about the business of breeding. Over the last couple of years I’ve added another interest to occupy some of the time and gone off looking for butterflies, dragonflies and just lately having been lent a moth trap I’ve been doing just that, trapping moths. 10,000 birds might seem a challenge but moth identification is a whole new way of messing up your head. I won’t take up much space as the main men may disapprove and suggest I go off and setup 50,000 moths if I want to talk about Nighthawk food at any length. 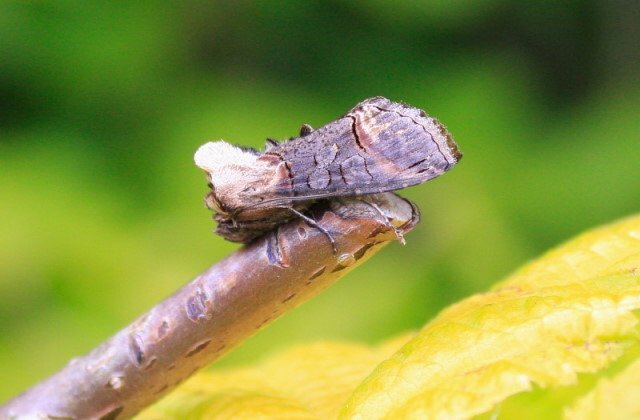 Not sure if moth trapping and identification is big in the US but I’d be interested to hear if anyone is doing any. 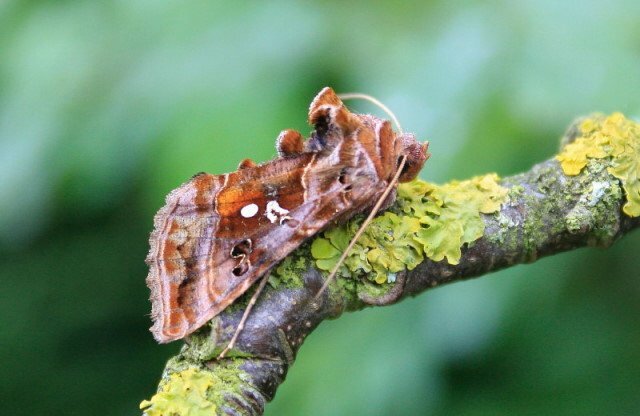 I have found it’s a great way to get the kids to connect a little with some ‘nature’ and I’ve now recorded over a hundred species in my modest garden. Getting up in the morning becomes a little easier when you can look forward to find beauties like these below in the trap. With a high flying career in business management Alan Tilmouth was once described as an irruptive birder. With the arrival of twins to add to his existing two kids in 2007 he grabbed the opportunity to bring some life changes. Business sold, he is now a full-time dad, birder, and blogger. Alan lives in Northumberland England's most northerly county, works part-time as part of the birdguides news team, tinkers with freelance writing and tries to figure out how his DSLR works. You can read his blog here. That photo of the twitchers looking over the fence is priceless and explains a lot about our strange passion. The picture of the birder queue is awesome. I don’t think I’ve ever seen a scene like that for a rare bird in the U.S. I share your enthusiasm for moths. (Well, maybe “enthusiasm” isn’t quite the right word for it….) I started putting out a black light and white sheet last summer to attract and photograph moths for identification. So far I’ve identified about 60 species in the yard, and I have a feeling there are a lot more out there. I agree with John… I don’t know of a bird in the U.S. that has commanded such throngs of attention. The birding scene seems so different in the U.K., which I mean in an admiring way. Thanks for sharing this, Alan! …and you know we love moths around here. “Sadly the mainstream media here in Britain continue to view birders as a bit ‘odd’” In fairness, I’m a birder and I find twitchers “odd”. I don’t necassarily think the designation is mean or even lacks affection. I also find my friends who are staying up to midnight to see the last Harry Potter film (probably in costume) “odd”. They are still awesome people. @jmj: But you caught it before anyone else so it is like there was no mistake. @Duncan @jmj The ‘media issue’ for me is not just how they portray birders, though in recent days the journalistic licence has gone beyond a joke, but if they can play as loose with facts when reporting on a birding story what hope have we got for the accuracy of stuff that really matters? They aim to sell papers and are therefore using these stories to do just that, it leaves non-birders with the wrong impressions of birding and twitching (though I hate separating them, don’t we all just go places to see birds?). Alan – A twitcher would certainly be a birder but a birder is not necessarily a twitcher. I am not a twitcher. I’ve laughed, rolled on the floor, danced, jumped, sat down to have a beer, and stood speechless at the sight of a life bird. But I’ve never ever twitched even a single a muscle. I don’t even think being a lister necessarily makes you a twitcher. Or being interested in lifers. I like seeing new things and keeping track of what I’ve seen. But my blood doesn’t race at the thought of some poor bewildered half starved and utterly doomed ball of feathers miles from where it should be. I’d much rather see a White-throated Robin in Cyprus, or East Africa. @Duncan. yes, agreed. I want to see them all but where I see them is of very limited importance. I’ve hardly ever “chased” a bird and am only likely to do so if it is a lifer that’s hard to get globally (Ross’s Gull, Ivory Gull, or a freakin’ Kakapo if ever one turns up in Germany 😉 ). The Moths Are Coming! The Moths Are Coming! Where Are You Birding This Last Weekend of August 2013?